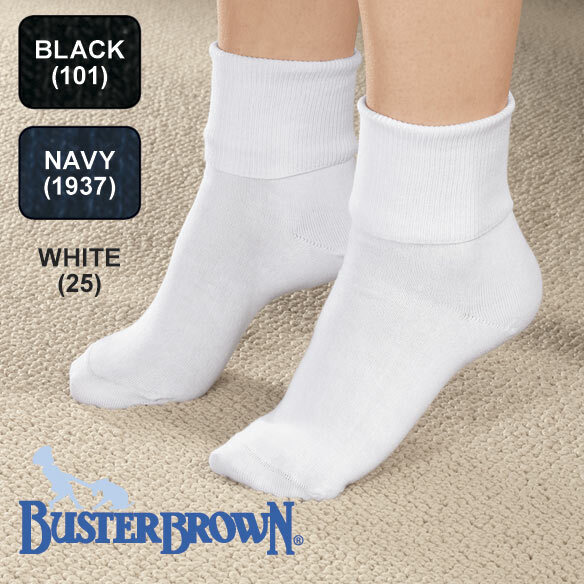 From Buster Brown®, a trusted name in leg wear for generations, these Buster Brown® ankle socks for everyday wear are pure cotton and non-elastic for supreme comfort. Seamless design won’t rub or bind. Specify size: Small fits women's shoe sizes 5-7, Medium fits 7 1/2 - 9, and Large fits 9 1/2 - 10 1/2. 3 pairs, all one color. Note: ankle socks run large and will shrink after laundering. I have bought these socks all my life. I like 100% cotton, and these socks are thin, which is a must for me. Buster Brown anklets are gentle on my nerve-damaged feet. 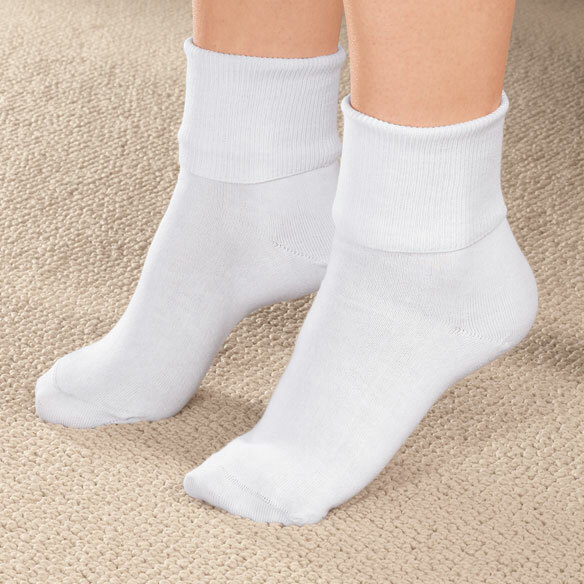 Comfortable cotton socks without elastic, similar to those I wore as a child. Not having a seam at the toe is a plus. Every year my mom appreciates receiving these socks. They are thin yet from strong knit and last for years. They are worth the price. These are the very best socks made. Pure 100% "breathable" cotton feels wonderful on your feet. The sizing is also very good. Buster Brown products have been around since I was a kid! This is a very durable lightweight cotton sock. The quality is high and will give wearer many months of service. The only problem I have is the sizing. I wear a size 5.5 shoe so ordered size small. The size small sock would comfortably fit a person wearing a size 7 or 8 shoe. If your foot is small you will need to find a different brand. Mom has small feet and we have found these socks to fit her at other times. The ones sold here were too thick and too big so I had to return them. my western boots. Love then!! These Socks Won't Get Knocked Off! I love the softness of these socks. They are comfortable, as well. And they fit perfectly. These good socks are so soft and comfy. They are beautifully made and come in 3 different sizes, assuring the right fit. For me the biggest selling point is that they contain no elastic. That's become almost impossible to find, and is so important for people with diabetes, poor circulation, or edema. Fit well and fabric is soft. am extremely allergic,these are only sock's I can wear! No tight cuffs that leave marks. Ordering more today. Just love, love, love them!! I don't like sweaty feet in the summer and want my sandals' inner soles clean and dry. Since I'm AARP-eligible I figure I can get away with wearing ankle socks with my sandals if I want to. I've also been known to wear some of the darker-toned sandals well into the fall before switching to boots. I usually wear jeans, anyway, but also some low-calf to ankle-length dresses and skirts, and BB dark cotton socks work just fine. I use the white ones with lighter colored shoes or sandals. I love the fit of these socks (I buy Medium) on my size 8.5C feet, as they are neither too loose or too tight. If I leave them un-cuffed, they come up to just about 2 inches below the bulge of the calf muscle, which is a good length for my accustomed attire. Easy to wear with shoes, washes well and holds it's shape. I can only wear 100% cotton. I have allergies. Please keep making the socks. I have worn the Buster Brown socks sine I was a small child. It is so nice to have my feet free from allergy caused by the other types of socks that claim to be free but when you read the small print they have other materials added. Please keep making the 100% cotton. I want to order some in colors later on. Once you get the right size, these socks are soothing for painful feet. However, they tend to get "baggy" and loose. They are great for wearing durning cold weather. I really like these anklets! They are well-made, do not bind and are cooling and soothing to your feet. A good product and purchase! I sent them back. They were cut toooooo big for my size 5-5.5 feet. I ordered & rcvd small, but the foot was 1.5" too long and overall the socks were too loose. navy and black look the same. wish other colors were offered. nice, soft cotton. They are nice socks, they are thinner than I thought and they are very big. I take a size 71/2. I used the scale and it said that my best fit would be large. They are larger and thinner than expected. They might be great if you have a bigger foot. I think they would be. These run huge and are absolutely the cheapest socks I have ever seen - almost see-through. No shrinkage after washing. I wear a six, bought a small and they are way too big and the ankle is up out of my shoe in the back. Too cheap to return after shipping and $7 deduction. Too big, can not wear! They are 100% cotton and not tight on my ankles. Need loose-fitting, All-cotton socks. No elastic. My mom said that they are really comfortable. Buster Brown has been around many years. They are all cotton which means there is no spandex to make my ankles and legs swell. For Aunt in nursing home. Loose on ankles for diabetes. I love these socks, so soft and comforting to my feet. I often sleep in them. They also stay up or folded down. in town the only kind of socks i can find are those with spandex which after washed shrink and are very tight. I like cotton socks to sleep in! They are perfect to sleep in. They fit swollen feet and have no seams to irritate toes. I love real cotton and although these seem a bit expensive, I deserve the best! Cotton makes skin breathe, no sweating. Fit is perfect, have very sensitive feet and they are large enough, love 'em! I have look all over for theses socks, so happy I found these. I prefer the cotton sock to the synthetic ones that slip down too easily while walking, especially without shoes. I need some lightweight socks, I used to wear Buster Brown socks when I was younger as did my children. Good product. I like anklets because other socks are too high and my calves are big. these sox are VERY hard to find! so happy to find them here! These are in addition to ones I already own. The foot is non-stretch and vety comfortable. I have used these in the past for many years!! I love them. You had what I needed. The price was right. I must wear only cotton socks, nylon makes me break out on my feet. Sometimes they are hard to find. Needed some thin socks to use with various shoes. Is this for 1 pr or maybe more? BEST ANSWER: Thank you for your question. This item is for a set of three. We hope this information will be of help to you. I don't remember exactly how many I purchased at that time, but I believe it was more than 1--maybe 2 or 3. It is usually 3 pair. You are buying a set. It's for three pairs and they are great. are these socks made in the USA? BEST ANSWER: Thank you for your question. The Buster Brown Cotton Anklets are made in China. We hope this information will be of help to you. BEST ANSWER: Thank you for your question. Yes, the come in black, white and navy blue. We hope this information will be of help to you. they come in black and navy blue also. do these socks come in navy blue? BEST ANSWER: Thank you for your question. The Buster Brown ankle socks do come in Navy Blue. When selecting the color be sure to select the Navy blue as the color. We hope this information will be of help to you. According to your catalog that I received today, they come in navy blue. I don't understand why they are available in the catalog and not on line. Can I get Buster Brown socks for men? BEST ANSWER: Thank you for your question. At this time we do no carry the Buster Brown socks in men sizes. We hope this information will be of help to you and apologize for any inconvenience.